A rare fossil from eastern North America of a dog-sized horned dinosaur has been identified by a scientist at the University of Bath. The fossil provides evidence of an east-west divide in North American dinosaur evolution. During the Late Cretaceous period, 66-100 million years ago, the land mass that is now North America was split in two continents by a shallow sea, the Western Interior Seaway, which ran from the Gulf of Mexico to the Arctic Ocean. Dinosaurs living in the western continent, called Laramidia, were similar to those found in Asia. However, few fossils of animals from the eastern 'lost continent' of Appalachia have been found because these areas being densely vegetated, making it difficult to discover and excavate fossils. Dr Nick Longrich, from the Milner Centre for Evolution based in the University of Bath's Department of Biology & Biochemistry, studied one of these rare fossils, a fragment of a jaw bone kept in the Peabody Museum at Yale University. It turned out to be a member of the horned dinosaurs - the Ceratopsia. 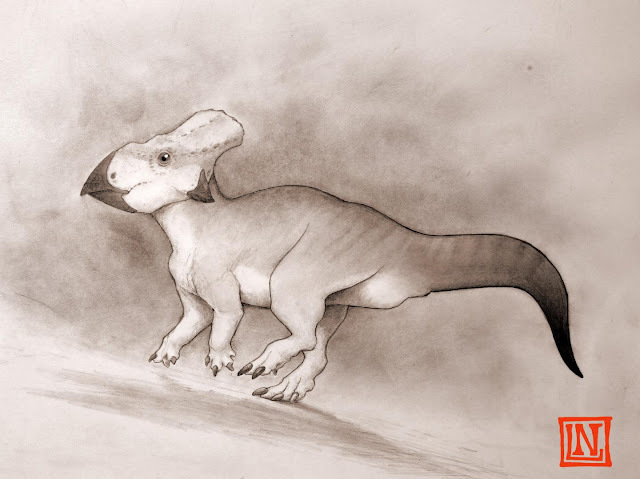 His study, published in the journal Cretaceous Research, highlights it as the first fossil from a ceratopsian dinosaur identified from this period of eastern North America. Ceratopsia is a group of plant-eating horned dinosaurs that lived in the Cretaceous period. The fossil in question comes from a smaller cousin of the better known Triceratops, the leptoceratopsids. It was about the size of a large dog. The specimen studied by Longrich was too incomplete to identify the exact species accurately, but showed a strange twist to the jaw, causing the teeth to curve downward and outwards in a beak shape. The jaw was also more slender than that of Ceratopsia found in western North America, suggesting that these dinosaurs had a different diet to their western relatives, and had evolved along a distinct evolutionary path. Dr Nick Longrich explained: "Just as many animals and plants found in Australia today are quite different to those found in other parts of the world, it seems that animals in the eastern part of North America in the Late Cretaceous period evolved in a completely different way to those found in the western part of what is now North America due to a long period of isolation. "This adds to the theory that these two land masses were separated by a stretch of water, stopping animals from moving between them, causing the animals in Appalachia to evolve in a completely different direction, resulting in some pretty weird looking dinosaurs. "Studying fossils from this period, when the sea levels were very high and the landmasses across the Earth were very fragmented, is like looking at several independent experiments in dinosaur evolution. "At the time, many land masses - eastern North America, Europe, Africa, South America, India, and Australia - were isolated by water. "Each one of these island continents would have evolved its own unique dinosaurs- so there are probably many more species out there to find." If you've ever felt lackadaisical to start a new project, focus on imagining the joy of completing it, say University of Michigan researchers. Both are a function of dopamine, which explains the motivation to start and the satisfaction of finishing work, they say. In a new study, U-M researchers Arif Hamid and Joshua Berke, professor of psychology and biomedical engineering, argue that dopamine levels continuously signal how good or valuable the current situation is regarding obtaining a reward. This message helps people decide how vigorously to work toward a goal, while also allowing themselves to learn from mistakes. "We provide a new theoretical account for how dopamine affects learning (what to do later) and motivation (getting fired up to go now) simultaneously," said study lead author Hamid, U-M neuroscience doctoral student. For many years, researchers have known that dopamine is important for arousal, movement, mood and executing activities with haste and vigor. Aspects of these normal dopamine functions are highlighted in disorders, such as Parkinson's disease and depression. Drugs that elevate brain dopamine levels, like cocaine or amphetamines, produce euphoric feelings of well-being, in addition to heightened arousal and attention. Aside from affecting immediate mood and behavior, dopamine also produces changes in the brain that are persistent, sometimes lasting a lifetime. "This is basically how we stamp in memories of what the smell of cookies or the McDonald's sign mean: predictors of delicious, calorie rich rewards," Hamid said. Abrupt dopamine increases when a person perceives stimuli that predict rewards is a dominant mechanism of reward learning within the brain—a concept similar to Russian physiologist Ivan Pavlov's dog hearing the bell and salivating at a response to stimuli, he said. Hamid said the precise mechanism of how a neurotransmitter can achieve both invigorating and learning functions is counterintuitive, and many decades of neuropsychological research has attempted to resolve exactly how. One theory, spearheaded by U-M psychologists Kent Berridge and Terry Robinson, suggests that dopamine invigorates actions toward desired goals. For example, rats with almost no brain dopamine will not retrieve food a few inches away while they're starving. Another theory suggests dopamine is a "teaching signal," like a coach who tells his player "good job" or "bad job" to encourage a future reward. In the current study, U-M researchers describe those dopamine fluctuations as a continuous cheer to motivate, with brief moments of criticism. They measured dopamine levels in rats while they performed a decision-making task, and compared it with how motivated the rats were and how much they learned. They also increased dopamine levels to artificially motivate the rats and repeatedly made them learn to perform actions that did not produce rewards. The findings appear in the current issue of Nature Neuroscience. The study's other authors include Jeffrey Pettibone, Omar Mabrouk, Vaughn Hetrick, Robert Schmidt, Caitlin Vander Weele, Robert Kennedy and Brandon Aragona. The work was supported by grants from the National Institute on Drug Abuse (DA032259, DA007281), National Institute of Mental Health (MH093888, MH101697), National Institute on Neurological Disorders and Stroke (NS078435, NS076401) and National Institute of Biomedical Imaging and Bioengineering (EB003320). R.S. was supported by the BrainLinks-BrainTools Cluster of Excellence funded by the German Research Foundation (DFG grant number EXC1086). A new study from the University of Exeter has found that teaching is not essential for people to learn to make effective tools. The results counter established views about how human tools and technologies come to improve from generation to generation and point to an explanation for the extraordinary success of humans as a species. The study reveals that although teaching is useful, it is not essential for cultural progress because people can use reasoning and reverse engineering of existing items to work out how to make tools. Although teaching is useful, it is not essential for cultural progress. The capacity to improve the efficacy of tools and technologies from generation to generation, known as cumulative culture, is unique to humans and has driven our ecological success. It has enabled us to inhabit the coldest and most remote regions on Earth and even have a permanent base in space. The way in which our cumulative culture has boomed compared to other species however remains a mystery. It had long been thought that the human capacity for cumulative culture was down to special methods of learning from others - such as teaching and imitation - that enable information to be transmitted with high fidelity. To test this idea, the researchers recreated conditions encountered during human evolution by asking groups of people to build rice baskets from everyday materials. Some people made baskets alone, while others were in ’transmission chain’ groups, where each group member could learn from the previous person in the chain either by imitating their actions, receiving teaching or simply examining the baskets made by previous participants. Teaching produced the most robust baskets but after six attempts all groups showed incremental improvements in the amount of rice their baskets could carry. The results of the study shed light on ancient human society and help to bridge the cultural chasm between humans and other species. The researchers say that to fully understand those elements that make us different from other animals, future work should focus on the mental abilities of individuals and not solely mechanisms of social learning. Kids and teens who take medications like Ritalin to treat attention-deficit hyperactivity disorder are twice as likely to be physically or emotionally bullied by peers than those who don't have ADHD, a new University of Michigan study found. The main findings are the same for both sexes, said the study's first author, Quyen Epstein-Ngo, research assistant professor at the U-M Institute for Research on Women and Gender and a fellow at the U-M Injury Center. Carol Boyd, professor of nursing, is the principal investigator. It's long been known that kids with ADHD have a harder time making and keeping friends and are bullied and victimized more. This study is believed to be the first known to look at how stimulant medications affect their relationships with peers. "Many youth with ADHD are prescribed stimulant medications to treat their ADHD and we know that these medications are the most frequently shared or sold among adolescents," said Epstein-Ngo, a licensed clinical psychologist. The U-M researchers surveyed nearly 5,000 middle and high school students over four years. About 15 percent were diagnosed with ADHD and roughly 4 percent were prescribed stimulants within the past 12 months. Of those who took ADHD meds, 20 percent reported being approached to sell or share them, and about half of them did. When looking at the overall figures, relatively few students were asked to divert their medications or did. However, Epstein-Ngo said the numbers don't tell the entire story. "Having a diagnosis of ADHD has lifelong consequences," she said. "These youth aren't living in isolation. As they transition into adulthood, the social effects of their ADHD diagnosis will impact a broad range of people with whom they come into contact." From 2003 to 2011, there was a 42 percent increase in ADHD cases diagnosed in the U.S., and between 2007 and 2011, there was a 27 percent increase in stimulant-treated. Epstein-Ngo said the findings shouldn't scare parents away from considering a stimulant medication. Rather, the study reinforces why parents must talk to kids about never sharing their medications. "For some children stimulant medications are immensely helpful in getting through school," Epstein-Ngo said. 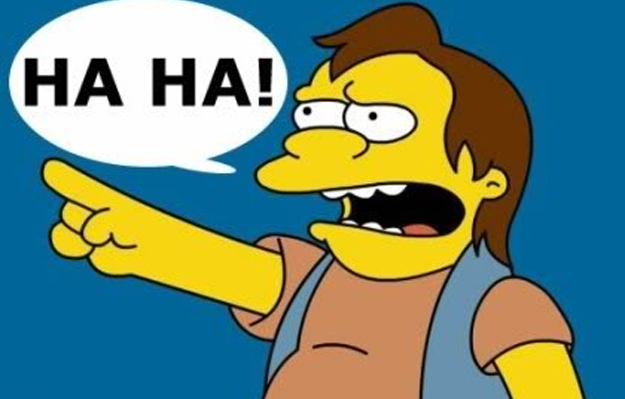 "This study doesn't say 'don't give your child medication.' It suggests that it's really important to talk to your children about who they tell." It's unclear why kids with prescriptions for stimulant medications are more at risk for bullying and victimization, but Epstein-Ngo said it's probably several factors. "Is it a function of the fact that they are in riskier situations, or are they being coerced and forced to give up their medications? Probably a little bit of both," she said. Epstein-Ngo believes the biggest takeaway is to have compassion for kids with ADHD. "I think the biggest misconception about ADHD is that these kids aren't trying hard enough, and that's just not the case," she said. "If these kids could do better they would. With the proper support and treatment they can overcome this." 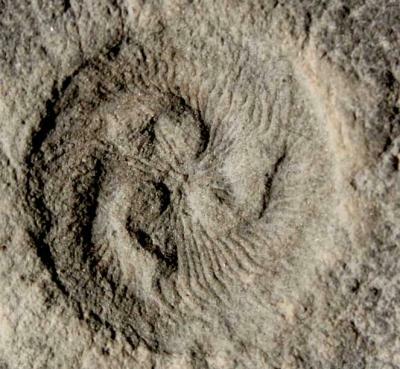 Computer simulations have allowed scientists, led by Dr Imran Rahman of the University of Bristol, UK to work out how this 555-million-year-old organism with no known modern relatives fed. Their research reveals that some of the first large, complex organisms on Earth formed ecosystems that were much more complex than previously thought. Dr Simon Darroch, an Assistant Professor at Vanderbilt University, said: "For many years, scientists have assumed that Earth's oldest complex organisms, which lived over half a billion years ago, fed in only one or two different ways. Our study has shown this to be untrue,Tribrachidium and perhaps other species were capable of suspension feeding. This demonstrates that, contrary to our expectations, some of the first ecosystems were actually quite complex." Co-author Dr Marc Laflamme, an Assistant Professor at the University of Toronto Mississauga, added: "Tribrachidium doesn't look like any modern species, and so it has been really hard to work out what it was like when it was alive. The application of cutting-edge techniques, such as CT scanning and computational fluid dynamics, allowed us to determine, for the first time, how this long-extinct organism fed." Such simulations have allowed scientists, led by Dr Imran Rahman of the University of Bristol, UK to work out how this 555-million-year-old organism with no known modern relatives fed. Their research reveals that some of the first large, complex organisms on Earth formed ecosystems that were much more complex than previously thought. Dr Rahman, a Research Fellow in Bristol's School of Earth Sciences said: "The computer simulations we ran allowed us to test competing theories for feeding in Tribrachidium. This approach has great potential for improving our understanding of many extinct organisms." Co-author Dr Rachel Racicot, a postdoctoral researcher at the Natural History Museum of Los Angeles County added: "Methods for digitally analysing fossils in 3D have become increasingly widespread and accessible over the last 20 years. We can now use these data to address any number of questions about the biology and ecology of ancient and modern organisms." The research was funded by the UK's Royal Commission for the Exhibition of 1851. Women who have adequate levels of B vitamins in their bodies are more likely to get and stay pregnant even when they also have high levels of a common pesticide known to have detrimental reproductive effects, according to new Johns Hopkins Bloomberg School of Public Health research. The findings, published in the December issue of the American Journal of Clinical Nutrition, suggest that B vitamins may have a protective effect that counteracts the levels of DDT in their bodies. DDT, a known endocrine disruptor, is still used to kill mosquitoes in many countries where malaria remains a serious public health concern. 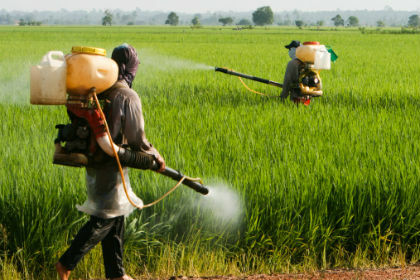 The United States banned the pesticide in 1972; China, where the study was conducted, followed suit in 1984. DDT, however, can remain in the body and environment for decades. The findings suggest that looking at toxins and nutrition in isolation doesn’t paint a full picture of how these different factors intersect. She says studies like this may provide a model for how future research groups can examine the relationship between other toxins and nutrients. For the study, conducted between 1996 and 1998, Wang and her colleagues recruited and followed a group of female Chinese textile workers who were trying to get pregnant. Every day for up to a year, researchers tested the urine of the women in the study, detecting their levels of hCG the hormone that signals conception. This approach allowed researchers to determine whether a woman was pregnant much earlier than she might normally find out, in the days over even weeks before she realized she’d missed a menstrual period. It also allowed the researchers to determine whether women had an early pregnancy loss (miscarried before six weeks of pregnancy). DDT and DDE (major degraded product of DDT) and B vitamin levels were measured in the women before conception. A 2003 study by Wang and her colleagues showed that one-third of all conceptions end before women even know they are pregnant. “This is a very vulnerable period,” she says. Among the 291 women ultimately included in the study, there were 385 conceptions, 31 percent of which were lost before six weeks. Women with high DDT levels and sufficient levels of vitamin B had a 42 percent greater chance of early miscarriage than women with lower DDT levels. But in those with high DDT levels and vitamin B deficiencies, women were twice as likely to suffer a miscarriage before six weeks of gestation. The researchers looked at three types of B vitamins – B-6, B-12 and folic acid – and determined that the risk to a pregnancy was higher with B-12 and folic acid deficiencies and with deficiencies in more than one type of B vitamins. The researchers also found that women with high DDT and low B vitamin levels took nearly twice as long to conceive in the first place. The standard of care in many nations is to give an iron-folate supplement to women once they seek prenatal health care, which typically occurs between eight and 12 weeks of gestation, if at all. But that supplement is rarely taken prior to conception, meaning it likely comes too late to prevent early pregnancy loss. And unlike in the United States, where many foods are fortified with folic acid, that is not the norm around the world. Difficulty conceiving is prevalent in both developed and developing countries. In the United States, the percentage of married women between the ages of 15 and 44 who had difficulty achieving and maintaining pregnancy increased from 8 percent in 1982 to 11.8 percent in 2002, an increase that cannot be completely explained by the age of the women. Better nutrition – including fortifying foods with B vitamins – in countries where DDT is still in wide use could improve pregnancy outcomes, Wang says. She says there may also be implications in the United States, particularly among women who immigrate from countries where DDT is still common and among low-income women whose diets may not include foods high in B vitamins such as leafy green vegetables and beans. Even women from the United States may have DDT in their systems, which may come from imported foods or even from local food grown in soil still contaminated with DDT. “Preconception serum 1,1,1-trichloro-2,2,bis(p-chlorophenyl)ethane and B-vitamin status: independent and joint effects on women’s reproductive outcomes” was written by Fengxiu Ouyang, Matthew P Longnecker, Scott A Venners, Sara Johnson, Susan Korrick, Jun Zhang, Xiping Xu, Parul Christian, Mei-Cheng Wang and Xiaobin Wang. The research was supported in part by grants from the National Institutes of Health’s National Institute of Child Health and Human Development (R01 HD32505) and the National Institute of Environmental Health Sciences (R01 ES11682 and R03 ES022790), the Intramural Research Program of the National Institute of Environmental Health Sciences. Schematic drawing, causes and effects of air pollution: (1) greenhouse effect, (2) particulate contamination, (3) increased UV radiation, (4) acid rain, (5) increased ground level ozone concentration, (6) increased levels of nitrogen oxides. Citation: “Ambient Coarse Particulate Matter and Hospital Admissions in the Medicare Cohort Air Pollution Study, 1999-2010” was written by Helen Powell, Jenna R. Krall, Yun Wang, Michelle L. Bell and Roger D. Peng. The research was supported by grants from the National Institutes of Health’s National Institute of Environmental Health Sciences (R01ES019560, R01ES019587 and R21ES021427); the National Institute on Aging (T32AG000247) and the EPA. A microscopic marine alga is thriving in the North Atlantic to an extent that defies scientific predictions, suggesting swift environmental change as a result of increased carbon dioxide in the ocean, a study led a by Johns Hopkins University scientist has found. A scanning electron microscope image of a coccolithophore, which can measure from 5 to 15 microns across, less than a fifth the width of a human hair. 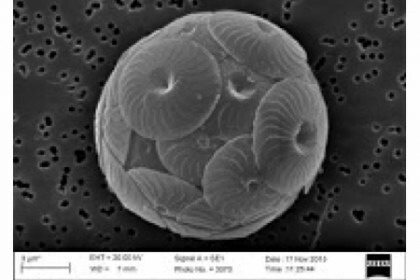 Published recently in the journal Science, the study details a tenfold increase in the abundance of single-cell coccolithophores between 1965 and 2010, and a particularly sharp spike since the late 1990s in the population of these pale-shelled floating phytoplankton. "Something strange is happening here, and it's happening much more quickly than we thought it should," saidAnand Gnanadesikan, associate professor in the Morton K. Blaustein Department of Earth and Planetary Sciences at Johns Hopkins and one of the study's five authors. Diamonds may not be as rare as once believed, but this finding in a new Johns Hopkins University research report won’t mean deep discounts at local jewelry stores. “Diamond formation in the deep Earth, the very deep Earth, may be a more common process than we thought,” said Johns Hopkins geochemist Dimitri A. Sverjensky, whose article co-written with doctoral student Fang Huang appears today in the online journal Nature Communications. The report says the results “constitute a new quantitative theory of diamond formation,” but that does not mean it will be easier to find gem-quality diamonds and bring them to market. For one thing, the prevalence of diamonds near the Earth’s surface – where they can be mined – still depends on relatively rare volcanic magma eruptions that raise them from the depths where they form. For another, the diamonds being considered in these studies are not necessarily the stuff of engagement rings, unless the recipient is equipped with a microscope. Most are only a few microns across and are not visible to the unaided eye. Using a chemical model, Sverjensky and Huang found that these precious stones could be born in a natural chemical reaction that is simpler than the two main processes that up to now have been understood to produce diamonds. Specifically, their model – yet to be tested with actual materials – shows that diamonds can form with an increase in acidity during interaction between water and rock. The common understanding up to now has been that diamonds are formed in the movement of fluid by the oxidation of methane or the chemical reduction of carbon dioxide. Oxidation results in a higher oxidation state, or a loss of electrons. Reduction means a lower oxidation state, and collectively the two are known as “redox” reactions. “It was always hard to explain why the redox reactions took place,” said Sverjensky, a professor in the Morton K. Blaustein Department of Earth and Planetary Sciences in the university’s Krieger School of Arts and Sciences. The reactions require different types of fluids to be moving through the rocks encountering environments with different oxidation states. The new research showed that water could produce diamonds as its pH falls naturally – that is, as it becomes more acidic – while moving from one type of rock to another, Sverjensky said. The finding is one of many in about the last 25 years that expands scientists’ understanding of how pervasive diamonds may be, Sverjensky said. Nobody has yet put a number on the greater abundance of diamonds, but Sverjensky said scientists are working on that with chemical models. It’s impossible to physically explore the great depths at which diamonds are created: roughly 90 to 120 miles below the Earth’s surface at intense pressure and at temperatures about 1,650 to 2,000 degrees Fahrenheit. The deepest drilling exploration ever made was about 8 or 9 miles below the surface, he said. If the study doesn’t shake the diamond markets, it promises to help shed light on fluid movement in the deep Earth, which helps account for the carbon cycle on which all life on the planet depends. This research was supported by grants from the Sloan Foundation through the Deep Carbon Observatory (Reservoirs and Fluxes and Extreme Physics and Chemistry programs) and by a U.S. Energy Department grant, DE-FG-02-96ER-14616. In sub-Saharan Africa, dozens of major 'development corridors,' including roads, railroads, pipelines, and port facilities, are in the works to increase agricultural production, mineral exports, and economic integration. And, if all goes according to plan, it's going to be a disaster, say researchers reporting in the Cell Press journal Current Biology on Nov. 25. 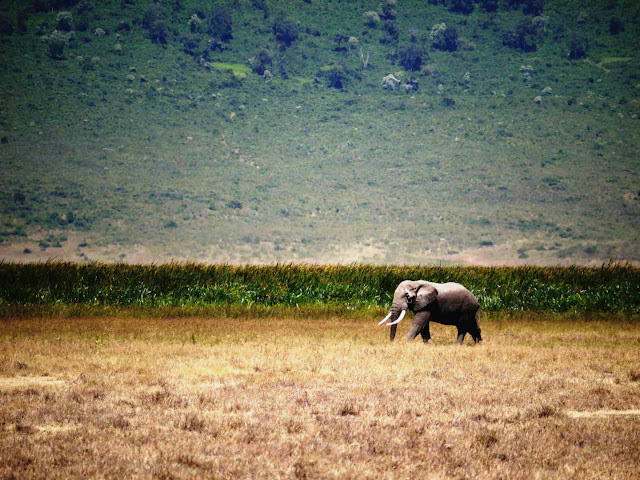 They assessed the potential environmental impacts of 33 planned or existing corridors -- spanning 53,000 kilometers -- that would crisscross much of the African continent, opening up vast areas of sparsely populated land. This photo shows a savannah elephant, one of many animals expected to be affected by poaching with a dramatic expansion of African roads. "In terms of development pressures, these corridors would be the biggest thing to hit Africa -- ever," says William Laurance of the Centre for Tropical Environmental and Sustainability Science at James Cook University in Cairns, Australia. Earlier this year, Laurance and his colleagues issued a warning that this unprecedented expansion of infrastructure would come at a great cost. In the new study, he and his colleagues sought to quantify those costs by mapping each corridor along with the estimated human occupancy and the environmental values, including endangered and endemic vertebrates, plant diversity, critical habitats, carbon storage, and climate-regulation services, inside a 50-kilometer-wide band overlaid onto each corridor. They also assessed the potential for each corridor to facilitate increases in agricultural production. Over 53,000 kilometers of development corridors have been proposed or are underway in sub-Saharan Africa. These corridors are intended to rapidly accelerate agriculture, mining, and land colonization, often in sparsely populated areas. In this Current Biology video abstract, Distinguished Professor William Laurance describes how the corridors were found to vary greatly in their potential socioeconomic benefits and likely environmental costs, with some corridors posing severe risks for key African ecosystems. "We found striking variability in the likely environmental costs and economic benefits of the 33 'development corridors' that we assessed,' Laurance says. "Some of the corridors seem like a good idea, and some appear to be a really bad idea. Several of the corridors could be environmentally disastrous, in our view." Based on the findings, Laurance says he thinks some of the planned development corridors should be cancelled altogether. His biggest concerns fall in areas near the equator, such as the Congo Basin, West Africa, and the rich tropical savannahs. Other corridors should proceed only with the most stringent safeguards and mitigation measures in place. Change won't come easily. "The proponents of these projects include some very powerful economic interests, and no one can dispute the dire need to increase food security and economic development in Africa, where populations are growing very rapidly," Laurance says. "The trick -- and it's going to be a great challenge -- will be to amp up African food production without creating an environmental crisis in the process." However, he and his colleagues were surprised to find that many of the proposed corridors are planned for places where the agricultural potential appears to be very limited, because of poor soils or climates or the remoteness of the area in question. "One of the key justifications for these corridors is to ramp up farm and food production, but in fact it appears that massive mining investments--securing access to high-volume minerals such as iron ore and coal--are actually a key driver for a number of the corridors," Laurance says. 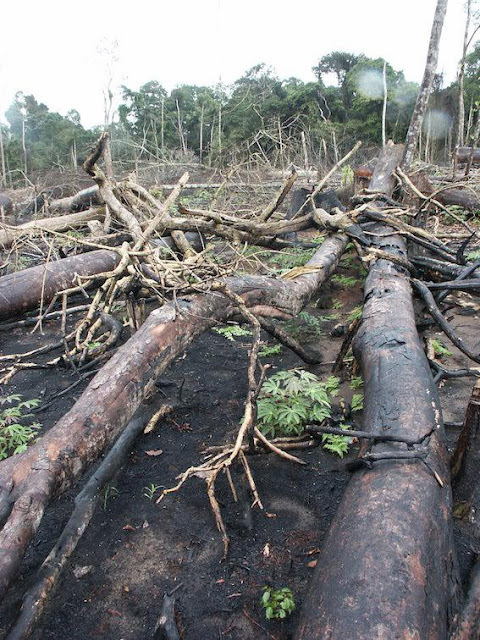 This photo shows deforestation in Africa, one of the expected effects of poorly planned road expansion. The researchers are calling for key stakeholders -- African governments, international lenders and donors, private investors, and others -- to carefully scrutinize the development corridors. He and his team hope to advance a research agenda aimed at better environmental assessment and planning for those corridors that do move forward. They also plan to follow up this comprehensive survey with more detailed studies of key corridors and to develop more local partnerships to advance this work. "Africa is now facing a 'decade of decision,'" Laurance says. "The stakes are enormous. Once any particular development corridor is established, Pandora's Box will be opened and there won't be very much that one can do to control the onslaught of hunting, habitat disruption, and legal and illegal mining activities. The only real chance to manage this situation is to stop those corridors that are most likely to cause truly profound environmental damage and to create stringent land-use planning around those corridors that do proceed." This work was supported by the Australian Research Council, the Australian Council for International Agricultural Research, and James Cook University. VY Canis Majoris is a stellar goliath, a red hypergiant, one of the largest known stars in the Milky Way. It is 30-40 times the mass of the Sun and 300 000 times more luminous. In its current state, the star would encompass the orbit of Jupiter, having expanded tremendously as it enters the final stages of its life. The new observations of the star used the SPHERE instrument on the VLT. Theadaptive optics system of this instrument corrects images to a higher degree than earlier adaptive optics systems. This allows features very close to bright sources of light to be seen in great detail . SPHERE clearly revealed how the brilliant light of VY Canis Majoris was lighting up clouds of material surrounding it. In this very close-up view from SPHERE the star itself is hidden behind an obscuring disc. The crosses are artefacts due to features in the instrument. And by using the ZIMPOL mode of SPHERE, the team could not only peer deeper into the heart of this cloud of gas and dust around the star, but they could also see how the starlight was scattered and polarised by the surrounding material. These measurements were key to discovering the elusive properties of the dust. Careful analysis of the polarisation results revealed these grains of dust to be comparatively large particles, 0.5 micrometres across, which may seem small, but grains of this size are about 50 times larger than the dust normally found in interstellar space. 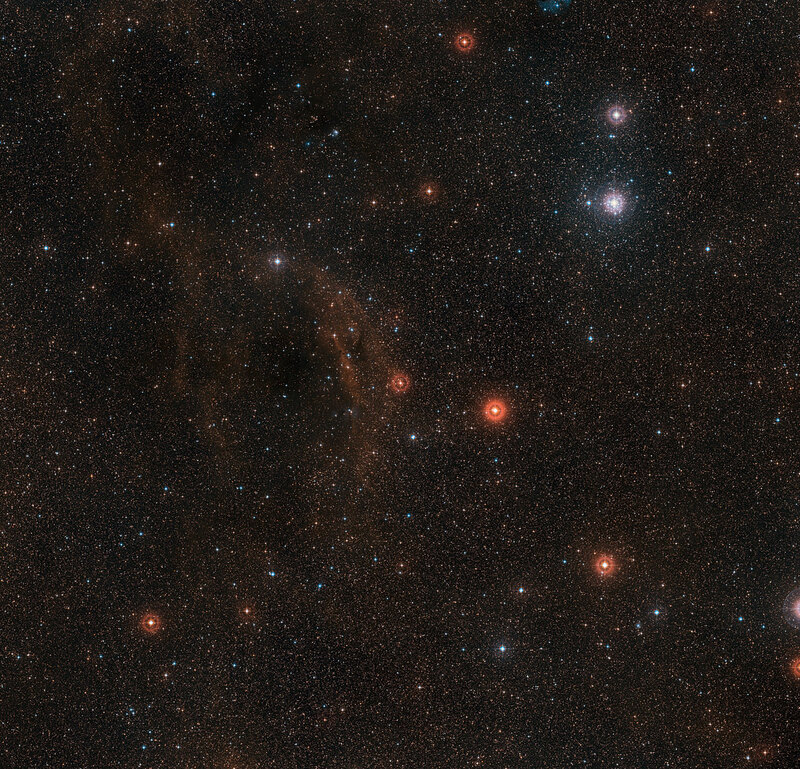 This wide-field view shows the sky around the very brilliant red hypergiant star VY Canis Majoris, one of the largest stars known in the Milky Way. The star itself appears at the centre of the picture, which also includes clouds of glowing red hydrogen gas, dust clouds and the bright star cluster around the bright star Tau Canis Majoris towards the upper right. This picture was created from images forming part of the Digitized Sky Survey 2. Throughout their expansion, massive stars shed large amounts of material -- every year, VY Canis Majoris sees 30 times the mass of the Earth expelled from its surface in the form of dust and gas. This cloud of material is pushed outwards before the star explodes, at which point some of the dust is destroyed, and the rest cast out into interstellar space. This material is then used, along with the heavier elements created during the supernova explosion, by the next generation of stars, which may make use of the material for planets. 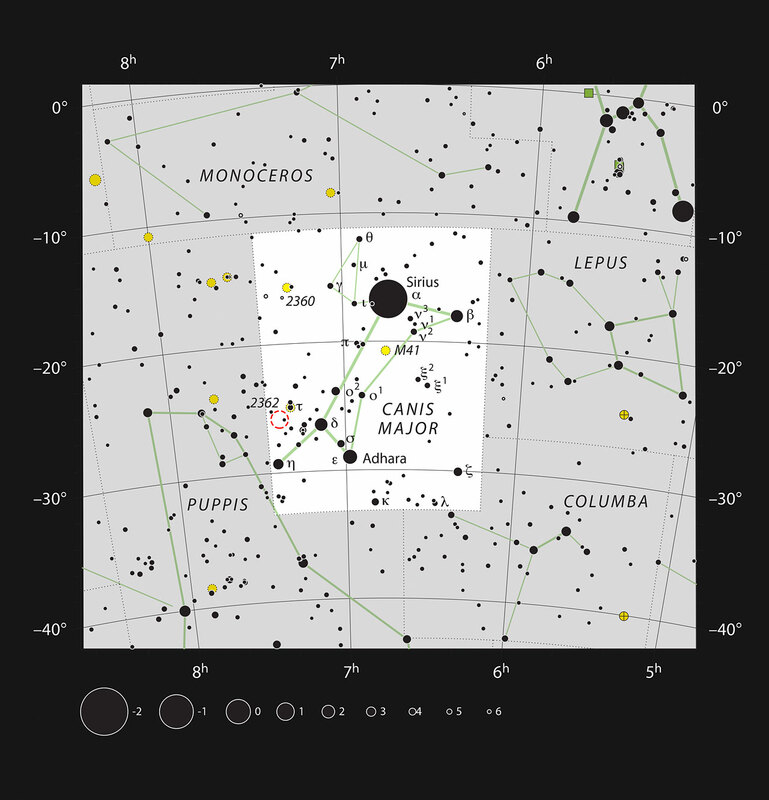 This chart shows the location of the very brilliant red hypergiant star VY Canis Majoris, one of the largest stars known in the Milky Way. Most of the stars visible to the naked eye on a clear and dark night are shown and the location of VY Canis Majoris is marked with a red circle. This star is visible in a small telescope and has a strikingly red colour. Until now, it had remained mysterious how the material in these giant stars' upper atmospheres is pushed away into space before the host explodes. The most likely driver has always seemed to be radiation pressure, the force that starlight exerts. As this pressure is very weak, the process relies on large grains of dust, to ensure a broad enough surface area to have an appreciable effect . This video sequence takes you on a voyage from a broad vista of the sky into a close-up look at one of the biggest stars in the Milky Way, VY Canis Majoris. The final image comes from the SPHERE instrument on ESO’s Very Large Telescope in Chile. "Massive stars live short lives," says lead author of the paper, Peter Scicluna, of the Academia Sinica Institute for Astronomy and Astrophysics, Taiwan. "When they near their final days, they lose alot of mass. In the past, we could only theorise about how this happened. But now, with the new SPHERE data, we have found large grains of dust around this hypergiant. These are big enough to be pushed away by the star's intense radiation pressure, which explains the star's rapid mass loss." The large grains of dust observed so close to the star mean that the cloud can effectively scatter the star's visible light and be pushed by the radiation pressure from the star. The size of the dust grains also means much of it is likely to survive the radiation produced by VY Canis Majoris' inevitable dramatic demise as a supernova . This dust then contributes to the surrounding interstellar medium, feeding future generations of stars and encouraging them to form planets. SPHERE/ZIMPOL uses extreme adaptive optics to create diffraction-limited images, which come a lot closer than previous adaptive optics instruments to achieving the theoretical limit of the telescope if there were no atmosphere. Extreme adaptive optics also allows much fainter objects to be seen very close to a bright star. The images in the new study are also taken in visible light -- shorter wavelengths than the near-infrared regime, where most earlier adaptive optics imaging was performed. These two factors result in significantly sharper images than earlier VLT images. Even higher spatial resolution has been achieved with the VLTI, but the interferometer does not create images directly. The dust particles must be large enough to ensure the starlight can push it, but not so large that it simply sinks. Too small and the starlight would effectively pass through the dust; too large and the dust would be too heavy to push. The dust the team observed about VY Canis Majoris was precisely the right size to be most effectively propelled outwards by the starlight. The explosion will be soon by astronomical standards, but there is no cause for alarm, as this dramatic event is not likely for hundreds of thousands of years. It will be spectacular as seen from Earth -- perhaps as bright as the Moon -- but not a hazard to life here. The team is composed of P. Scicluna (Academia Sinica Institute for Astronomy and Astrophysics, Taiwan), R. Siebenmorgen (ESO, Garching, Germany), J. Blommaert (Vrije Universiteit, Brussels, Belgium), M. Kasper (ESO, Garching, Germany), N.V. Voshchinnikov (St. Petersburg University, St. Petersburg, Russia), R. Wesson (ESO, Santiago, Chile) and S. Wolf (Kiel University, Kiel, Germany). A new study sheds light on relationship between stimuli and delayed rewards, explaining how Pavlov's dogs were conditioned to drool. More than a century ago, Pavlov figured out that dogs fed after hearing a bell eventually began to salivate when they heard the ring. A Johns Hopkins University-led research team has now figured out a key aspect of why. In an article published in the journal Neuron, Johns Hopkins neuroscientist Alfredo Kirkwood settles a mystery of neurology that has stumped scientists for years: Precisely what happens in the brain when we learn, or how Pavlov's dogs managed to associate an action with a delayed reward to create knowledge. For decades scientists had a working theory of how it happened, but Kirkwood's team is now the first to prove it. "If you're trying to train a dog to sit, the initial neural stimuli, the command, is gone almost instantly—it lasts as long as the word sit," said Kirkwood, a professor with the university's Zanvyl Krieger Mind/Brain Institute. "Before the reward comes, the dog's brain has already turned to other things. The mystery was, 'How does the brain link an action that's over in a fraction of a second with a reward that doesn't come until much later?'" The working theory—which Kirkwood's team has validated—is that invisible "eligibility traces" effectively tag the synapses activated by the stimuli so that it can be cemented as true learning with the arrival of a reward. 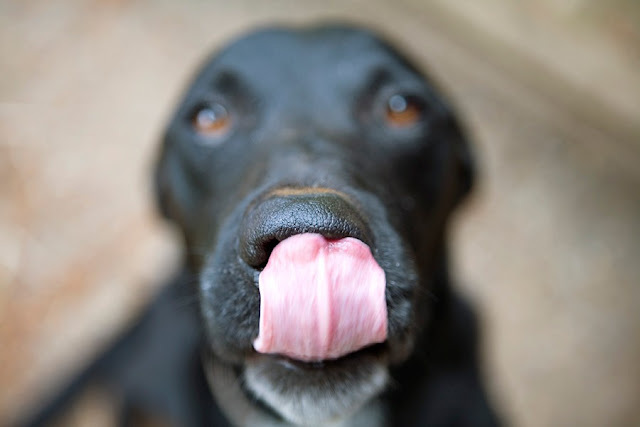 In the case of a dog learning to sit, when the dog gets a treat or a reward, neuromodulators like dopamine flood the dog's brain with "good feelings." Though the brain has long since processed the sit command, eligibility traces respond to the neuromodulators, prompting a lasting synaptic change. The team was able to prove the theory by isolating cells in the visual cortex of a mouse. When they stimulated the axon of one cell with an electrical impulse, they sparked a response in another cell. By doing this repeatedly, they mimicked the synaptic response between two cells as they process a stimulus and create an eligibility trace. When the researchers later flooded the cells with neuromodulators, simulating the arrival of a delayed reward, the response between the cells strengthened or weakened, showing the cells had "learned" and were able to do so because of the eligibility trace. "This is the basis of how we learn things through reward," Kirkwood said, "a fundamental aspect of learning." In addition to a greater understanding of the mechanics of learning, these findings could enhance teaching methods and lead to treatments for cognitive problems. Researchers included Johns Hopkins postdoctoral fellow Su Hong; Johns Hopkins graduate student Xiaoxiu Tie; former Johns Hopkins research associate Kaiwen He; along with Marco Huertas and Harel Shouval, neurobiology researchers at the University of Texas at Houston; and Johannes W. Hell, a professor of pharmacology at University of California, Davis. The research was supported by grants from JHU's Science of Learning Institute and National Institutes of Health. An international team of astrophysicists led by a Johns Hopkins University scientist has for the first time witnessed a star being swallowed by a black hole and ejecting a flare of matter moving at nearly the speed of light. The finding reported Thursday in the journal Science tracks the star -- about the size of our sun -- as it shifts from its customary path, slips into the gravitational pull of a supermassive black hole and is sucked in, said Sjoert van Velzen, a Hubble fellow at Johns Hopkins. 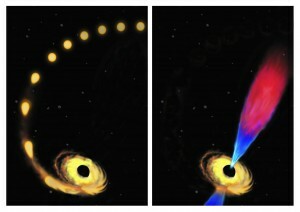 Artist’s conception of a star being drawn toward a black hole and destroyed (left), and the black hole later emitting a “jet” of plasma composed of debris left from the star’s destruction. Modified from an original image by Amadeo Bachar. Smoking high potency 'skunk-like' cannabis can damage a crucial part of the brain responsible for communication between the two brain hemispheres, according to a new study by scientists from King's College London and Sapienza University of Rome. Exploring the impact of cannabis potency is particularly important since today's high potency 'skunk-like'products have been shown to contain higher proportions of Δ9-tetrahydrocannabinol (THC) than they did around a decade ago. In experimental studies THC has been shown to induce psychotic symptoms and 'skunk-like' products high in THC are now thought to be the most commonly used form of cannabis in the UK. Dr Paola Dazzan, Reader in Neurobiology of Psychosis from the Institute of Psychiatry, Psychology & Neuroscience (IoPPN) at King's College London, and senior researcher on the study, said: 'We found that frequent use of high potency cannabis significantly affects the structure of white matter fibres in the brain, whether you have psychosis or not. Dr Dazzan added: 'There is an urgent need to educate health professionals, the public and policymakers about the risks involved with cannabis use. The study was led by Dr Tiago Reis Marques and Dr Paola Dazzan of the IoPPN at King's, and Dr Silvia Rigucci of Sapienza University of Rome. Mars is blanketed by a thin, mostly carbon dioxide atmosphere -- one that is far too thin to keep water from freezing or quickly evaporating. However, geological evidence has led scientists to conclude that ancient Mars was once a warmer, wetter place than it is today. To produce a more temperate climate, several researchers have suggested that the planet was once shrouded in a much thicker carbon dioxide atmosphere. For decades that left the question, "Where did all the carbon go?" The solar wind stripped away much of Mars' ancient atmosphere and is still removing tons of it every day. But scientists have been puzzled by why they haven't found more carbon -- in the form of carbonate -- captured into Martian rocks. They have also sought to explain the ratio of heavier and lighter carbons in the modern Martian atmosphere. 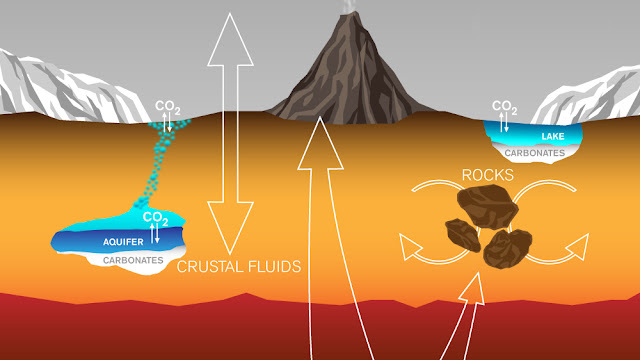 This graphic depicts paths by which carbon has been exchanged among Martian interior, surface rocks, polar caps, waters and atmosphere, and also depicts a mechanism by which it is lost from the atmosphere with a strong effect on isotope ratio. Now a team of scientists from the California Institute of Technology and NASA's Jet Propulsion Laboratory, both in Pasadena, offer an explanation of the "missing" carbon, in a paper published today by the journal Nature Communications. They suggest that 3.8 billion years ago, Mars might have had a moderately dense atmosphere. Such an atmosphere -- with a surface pressure equal to or less than that found on Earth -- could have evolved into the current thin one, not only minus the "missing" carbon problem, but also in a way consistent with the observed ratio of carbon-13 to carbon-12, which differ only by how many neutrons are in each nucleus. "Our paper shows that transitioning from a moderately dense atmosphere to the current thin one is entirely possible," says Caltech postdoctoral fellow Renyu Hu, the lead author. "It is exciting that what we know about the Martian atmosphere can now be pieced together into a consistent picture of its evolution -- and this does not require a massive undetected carbon reservoir." The escaped-to-space scenario has also been problematic. Because various processes can change the relative amounts of carbon-13 to carbon-12 isotopes in the atmosphere, "we can use these measurements of the ratio at different points in time as a fingerprint to infer exactly what happened to the Martian atmosphere in the past," says Hu. The first constraint is set by measurements of the ratio in meteorites that contain gases released volcanically from deep inside Mars, providing insight into the starting isotopic ratio of the original Martian atmosphere. The modern ratio comes from measurements by the SAM (Sample Analysis at Mars) instrument on NASA's Curiosity rover. One way carbon dioxide escapes to space from Mars' atmosphere is called sputtering, which involves interactions between the solar wind and the upper atmosphere. NASA's MAVEN (Mars Atmosphere and Volatile Evolution) mission has yielded recent results indicating that about a quarter pound (about 100 grams) of particles every second are stripped from today's Martian atmosphere via this process, likely the main driver of atmospheric loss. Sputtering slightly favors loss of carbon-12, compared to carbon-13, but this effect is small. The Curiosity measurement shows that today's Martian atmosphere is far more enriched in carbon-13 -- in proportion to carbon-12 -- than it should be as a result of sputtering alone, so a different process must also be at work. Modeling the long-term effects of this "ultraviolet photodissociation" mechanism, the researchers found that a small amount of escape by this process leaves a large fingerprint in the carbon isotopic ratio. That, in turn, allowed them to calculate that the atmosphere 3.8 billion years ago might have had a surface pressure a bit less thick than Earth's atmosphere today. "This solves a long-standing paradox," said Bethany Ehlmann of Caltech and JPL, a co-author of both today's publication and the August one about carbonates. "The supposed very thick atmosphere seemed to imply that you needed this big surface carbon reservoir, but the efficiency of the UV photodissociation process means that there actually is no paradox. You can use normal loss processes as we understand them, with detected amounts of carbonate, and find an evolutionary scenario for Mars that makes sense." An expanded view of comet C/2006 W3 (Christensen) is shown here. The WISE spacecraft observed this comet on April 20th, 2010 as it traveled through the constellation Sagittarius. Was it a catastrophic collision in the star's asteroid belt? A giant impact that disrupted a nearby planet? A dusty cloud of rock and debris? A family of comets breaking apart? Or was it alien megastructures built to harvest the star's energy? Just what caused the mysterious dimming of star KIC 8462852? This illustration shows a star behind a shattered comet. Observations of the star KIC 8462852 by NASA's Kepler and Spitzer space telescopes suggest that its unusual light signals are likely from dusty comet fragments, which blocked the light of the star as they passed in front of it in 2011 and 2013. The comets are thought to be traveling around the star in a very long, eccentric orbit. Massimo Marengo, an Iowa State University associate professor of physics and astronomy, wondered when he saw all the buzz about the mysterious star found by citizen scientists on the Planet Hunters website. Those citizen scientists were highlighting measurements of star brightness recorded by NASA's Kepler spacecraft. Tiny dips in a star's brightness can indicate a planet is passing in front of the star. That's how Kepler astronomers - and citizen scientists using the internet to help analyze the light curves of stars - are looking for planets. But this star had deep dips in brightness - up to 22 percent. The star's brightness also changed irregularly, sometimes for days and even months at a time. A search of the 150,000-plus stars in Kepler's database found nothing like this. So Marengo and two other astronomers decided to take a close look at the star using data taken with the Infrared Array Camera of NASA's Spitzer Space Telescope. They report their findings in a paper recently published online by The Astrophysical Journal Letters. "The scenario in which the dimming in the KIC 8462852 light curve were caused by the destruction of a family of comets remains the preferred explanation ...," wrote the three - Marengo; Alan Hulsebus, an Iowa State doctoral student; and Sarah Willis, a former Iowa State graduate student now with the Massachusetts Institute of Technology's Lincoln Laboratory. Questions about the star were launched last month when a research team led by Tabetha Boyajian of Yale University reported on the star in the Monthly Notices of the Royal Astronomical Society. The astronomers reported how citizen scientists tagged the star's deep and irregular dips in brightness as "bizarre" and "interesting." Boyajian and the other researchers looked at the data and investigated several possible causes. They wrote the "most promising theory" was a barrage of crumbling comets passing in front of the star. In a subsequent paper submitted to The Astrophysical Journal, Jason Wright and colleagues at Penn State University speculated about other causes, including alien megastructures built to harvest energy while orbiting the star. When the Iowa State astronomers studied the star with Spitzer infrared data from January 2015 - two years after the Kepler measurements - Marengo said they didn't see much. If there had been some kind of catastrophe near the star, he said there would be a lot of dust and debris. And that would show up as extra infrared emissions. So Marengo and his colleagues say the destruction of a family of comets near the star is the most likely explanation for the mysterious dimming. The comet fragments coming in rapidly at a steep, elliptical orbit could create a big debris cloud that could dim the star. Then the cloud would move off, restoring the star's brightness and leaving no trace of excess infrared light. And the alien megastructure theory? "We didn't look for that," Marengo said. "We can't really say it is, or is not. But what the star is doing is very strange. It's interesting when you have phenomena like that - typically it means there's some new physical explanation or a new concept to be discovered." The journey for volcanic rocks found on many volcanic islands began deep within the Earth. Brought to the Earth's surface in eruptions of deep volcanic material, these rocks hold clues as to what is going on deep beneath Earth's surface. Studies of rocks found on certain volcanic islands, known as ocean island basalts, revealed that although these erupted rocks originate from Earth's interior, they are not the same chemically. A group of former and current Arizona State University researchers say chemical differences found between rocks samples at volcanic hotspots around the world can be explained by a model of mantle dynamics that involves plumes, upwellings of abnormally hot rock within the Earth's mantle, that originate in the lower mantle and physically interact with chemically distinct piles of material. According to a group of current and former researchers at Arizona State University, the key to unlocking this complex, geochemical puzzle rests in a model of mantle dynamics consisting of plumes - upwelling's of abnormally hot rock within the Earth's mantle - that originate in the lower mantle and physically interact with chemically distinct piles of material. The team revealed that this theoretical model of material transport can easily produce the chemical variability observed at hotspot volcanoes (such as Hawaii) around the world. "This model provides a platform for understanding links between the physics and chemistry that formed our modern world as well as habitable planets elsewhere," says Curtis Williams, lead author of the study whose results are published in the Nov. 24 issue of the journalNature Communications. Basalts collected from ocean islands such as Hawaii and those collected from mid-ocean ridges (that erupt at spreading centers deep below oceans) may look similar to the naked eye; however, in detail their trace elements and isotopic compositions can be quite distinct. These differences provide valuable insight into the chemical structure and temporal evolution of Earth's interior. "In particular, it means that the Earth's mantle - the hot rock below Earth's crust but above the planet's iron core - is compositionally heterogeneous. Understanding when and where these heterogeneities are formed and how they are transported through the mantle directly relates to the initial composition of the Earth and how it has evolved to its current, habitable state," said Williams, a postdoc at UC Davis. 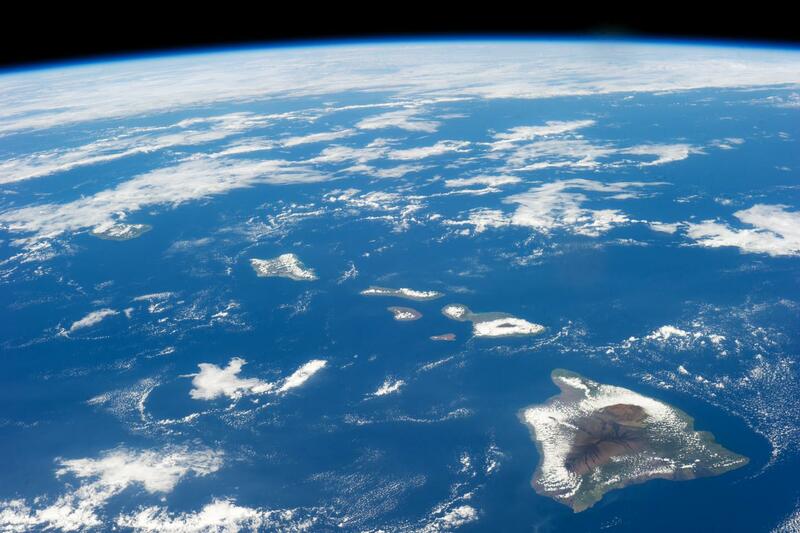 While a graduate student in ASU's School of Earth and Space Exploration, Williams and faculty members Allen McNamara and Ed Garnero conceived a study to further understand how chemical complexities that exist deep inside the Earth are transported to the surface and erupt as intraplate volcanism (such as that which formed the Hawaiian islands). Along with fellow graduate student Mingming Li and Professional Research Associate Matthijs van Soest, the researchers depict a model Earth, where in its interior resides distinct reservoirs of mantle material that may have formed during the earliest stages of Earth's evolution. Employing such reservoirs into their models is supported by geophysical observations of two, continent-sized regions - one below the Pacific Ocean and one below parts of the Atlantic Ocean and Africa - sitting atop the core-mantle boundary. "In the last several years, we have witnessed a sharpening of the focus knob on seismic imaging of Earth's deep interior. We have learned that the two large anomalous structures at the base of the mantle behave as if they are compositionally distinct. That is, we are talking about different stuff compared to the surrounding mantle. These represent the largest internal anomalies in Earth of unknown chemistry and origin," said Garnero. These chemically distinct regions also underlie a majority of hotspot volcanism, via hot mantle plumes from the top of the piles to Earth's surface, suggesting a potential link between these ancient, chemically distinct regions and the chemistry of hotspot volcanism. To test the validity of their model, Williams and coauthors compare their predictions of the variability of the ratios of helium isotopes (helium-3 and helium-4) in plumes to that observed in ocean island basalts. 3He is a so-called primordial isotope found in the Earth's mantle. It was created before the Earth was formed and is thought to have become entrapped within the Earth during planetary formation. Today, it is not being added to Earth's inventory at a significant rate, unlike 4He, which accumulates over time. Williams explained: "The ratio of helium-3 to helium-4 in mid-ocean ridge basalts are globally characterized by a narrow range of small values and are thought to sample a relatively homogenous upper mantle. On the other hand, ocean island basalts display a much wider range, from small to very large, providing evidence that they are derived from different source regions and are thought to sample the lower mantle either partially or in its entirety." The variability of 3He to 4He in ocean island basalts is not only observed between different hotspots, but temporally within the different-aged lavas of a single hotspot track. "The reservoirs and dynamics associated with this variability had remained unclear and was the primary motivation behind the study presented here," said Williams. Mars' largest moon, Phobos, is slowly falling toward the planet, but rather than smash into the surface, it likely will be shredded and the pieces strewn about the planet in a ring like the rings encircling Saturn, Jupiter, Uranus and Neptune. Though inevitable, the demise of Phobos is not imminent. It will probably happen in 20 to 40 million years, leaving a ring that will persist for anywhere from one million to 100 million years, according to two young earth scientists at the University of California, Berkeley. Mars could gain a ring in 10-20 million years when its moon Phobos is torn to shreds by tidal forces due to Mars' gravitational pull. Image by Tushar Mittal using Celestia 2001-2010, Celestia Development Team. In a paper appearing online this week in Nature Geoscience, UC Berkeley postdoctoral fellow Benjamin Black and graduate student Tushar Mittal estimate the cohesiveness of Phobos and conclude that it is insufficient to resist the tidal forces that will pull it apart when it gets closer to Mars. Just as earth's moon pulls on our planet in different directions, raising tides in the oceans, for example, so too Mars tugs differently on different parts of Phobos. As Phobos gets closer to the planet, the tugs are enough to actually pull the moon apart, the scientists say. This is because Phobos is highly fractured, with lots of pores and rubble. Dismembering it is analogous to pulling apart a granola bar, Black said, scattering crumbs and chunks everywhere. The resulting rubble from Phobos - rocks of various sizes and a lot of dust - would continue to orbit Mars and quickly distribute themselves around the planet in a ring. While the largest chunks would eventually spiral into the planet and collide at a grazing angle to produce egg-shaped craters, the majority of the debris would circle the planet for millions of years until these pieces, too, drop onto the planet in 'moon' showers, like meteor showers. Only Mars' other moon, Deimos, would remain. Black and Mittal, both in UC Berkeley's Department of Earth and Planetary Science, were drawn to the question of what might happen to Phobos because its fate is expected to be so different from that of most other moons in our solar system. "While our moon is moving away from earth at a few centimeters per year, Phobos is moving toward Mars at a few centimeters per year, so it is almost inevitable that it will either crash into Mars or break apart," Black said. 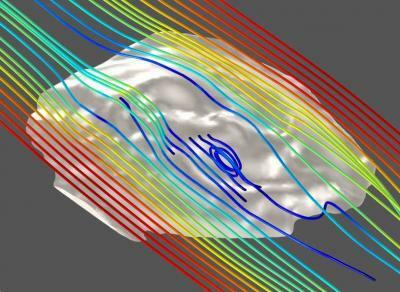 "One of our motivations for studying Phobos was as a test case to develop ideas of what processes a moon might undergo as it moves inward toward a planet." Only one other moon in the solar system, Neptune's largest moon, Triton, is known to be moving closer to its planet. Studying such moons is relevant to conditions in our early solar system, Mittal said, when it's likely there were many more moons around the planets that have since disintegrated into rings - the suspected origins of the rings of the outer planets. Some studies estimate that during planet formation, 20-30 percent of planets acquire moons moving inward and destined for destruction, though they would have long since disappeared. Some of Mars' several thousand elliptical craters may even have been formed by remnants of such moonlets crashing to the surface at a grazing angle. To estimate the strength of Phobos, Black and Mittal looked data from similarly fractured rocks on Earth and from meteorites that struck Earth and have a density and composition similar to Phobos. They also constrained the strength of Phobos based on results from simulations of the 10-kilometer diameter Stickney impact crater, which formed in the past when a rock rammed into Phobos without quite smashing the moon apart. That crater spans about one-sixth the circumference of Phobos and looks as if someone took a scoop out of the moon. Mars could gain a ring in 10-20 million years when its moon Phobos is torn to shreds by Mars gravity. Credit: Tushar Mittal using Celestia 2001-2010, Celestia Development Team. 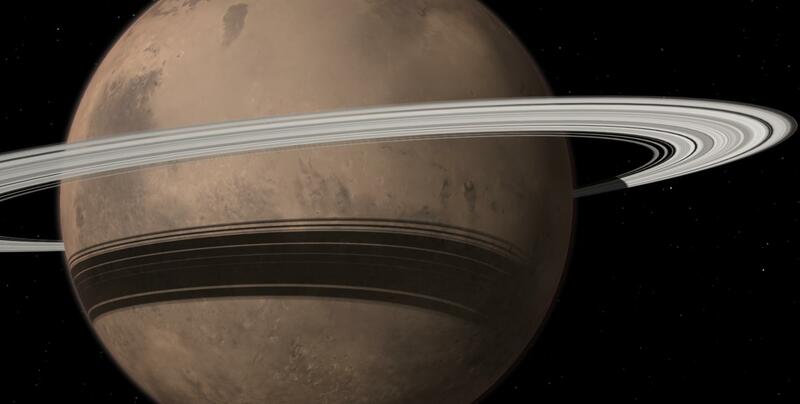 Once they determined when and how they expected tidal forces to tear Phobos apart, Mittal modeled the evolution of the ring, adapting techniques developed to understand Saturn's rings. 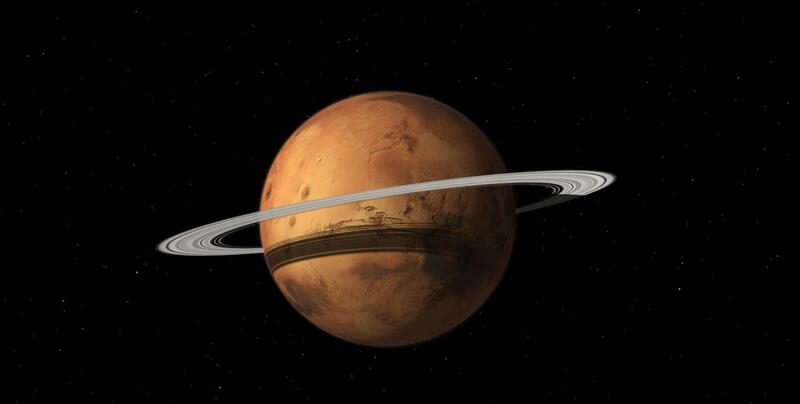 "If the moon broke apart at 1.2 Mars radii, about 680 kilometers above the surface, it would form a really narrow ring comparable in density to that of one of Saturn's most massive rings," Mittal said. "Over time it would spread out and get wider, reaching the top of the Martian atmosphere in a few million years, when it would start losing material because stuff would keep raining down on Mars." If the moon breaks up farther from Mars, the ring could persist for 100 million years before raining down on Mars, they found. Mittal said it's not clear whether the dust and debris rings would be visible from earth, since dust does not reflect much sunlight, whereas ice in the rings of the outer planets makes them easily visible. But Mars' ring may reflect enough light to make Mars slightly brighter as seen from Earth, he said, and through a telescope the shadows of the rings might also be visible on the surface. "Standing on the surface of Mars a few tens of millions of years from now, it would be pretty spectacular to watch," Black said.